Home » art » The Recycler Strikes Again! I spent the afternoon helping a friend with a very special art project, I failed to ask her permission to use the art, and I don’t feel comfortable using it without her permission. 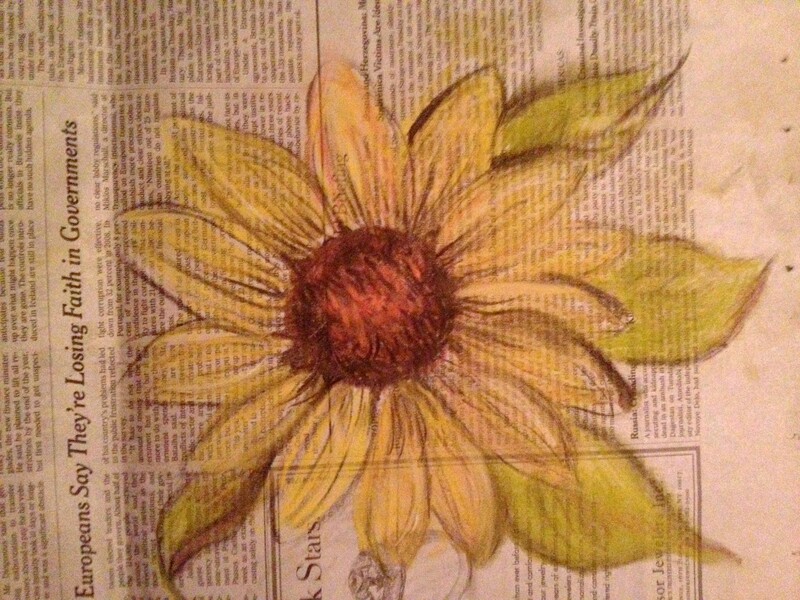 So tonight as I sit in the garden I decided to do another pastel on newspaper since I enjoyed the results last night. I have some Black-eyed Susan growing in the garden and honestly barely glanced at them, just sort of used the idea of them for inspiration. I grabbed a piece of today’s paper, grabbed my chalk and went to work. Not a masterpiece, just a very enjoyable exercise sitting outside on a beautiful night. I am itching to get back to oil painting, unfortunately I couldn’t get an appointment with my doctor until the end of the month, and until I know for sure that my lungs are clear, I must behave. I’ve been doing a lot of watercolor since I started this blog, and while I do enjoy it, I get bored using the same materials. I’m thinking it is time to pull out the acrylics. I’ve primarily used acrylics for painting on wood, not as much on canvas. I find them so difficult to maneuver. I think again, it is a matter of practice. Tomorrow is the day. I actually have an orphaned painting in mind, and looking forward to the challenge. Wish me luck! This entry was posted in art, Art and my life, Uncategorized and tagged art, drawing, Fine art, illustration, life, Paint, pastel, pencil drawing, projects, self esteem, Thought, Visual arts, writing. Bookmark the permalink.